Charles Radcliffe Cooper was born Scholing, near Southampton on 30th October 1854. He started working on the railways in 1869 at the age of 15. We understand that he was a booking and telegraph clerk based at Netley near Southampton. By 1871 and at the age of 16, Charles had already left home. He was working as a railway clerk, lodging in Itchen Abbas, near Winchester. In November 1872 he joined the Midland Railway Company at Woodville in Derbyshire and moved to Woodville Junction in 1874. In 1876 Charles married Emma Newbold who was born in Woodville, Derbyshire about 1858. The marriage was registered at Burton. In 1876 he was also appointed station master at Wichnor Junction and then took charge of two stations, Crossall and Wichnor Junction. The 1881 census shows Charles living at Croxall near Tamworth in Staffordshire. 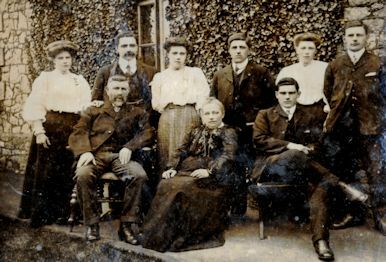 Living with him was Emma and their children: Phillip John P. born on 19th June 1877 in Woodville, Derbyshire, Lois Hedgland born on 1st April 1879 in Oakley, Staffordshire and Mabel Grace also born in Oakley on 25th December 1880. Later in 1881 Charles was appointed station master at Grimston in Leicestershire. Charles seems to have moved the family during the 1880’s. He and Emma had three more children, Emma Elizabeth born in 1882, Charles Newbold born in 1885, Horace Laurence born in 1888, all born in Saxilbye, near Melton Mowbray, Leicestershire. Finally in February 1888 Charles was moved to Thornbury and was to remain as stationmaster there for 33 years. Thornbury had opened a new railway line in 1872. Read about the coming of the railway to Thornbury. Charles and the family lived at Upper Bath Road, presumably at the Stationmaster’s House. They now had seven children including Harold Egbert Collins born in Thornbury in on 15th January 1890. The Cooper children attended the National School near St Mary’s Church. They seem to have done very well there. Their names were always at the top or near the top of the rankings for ‘best attenders’. On 28th April 1893 two of them received prizes at the exhibition of home industries at the Thornbury Castle Tennis Court, Mabel Cooper first prize for best made man’s shirt and Lois Cooper second prize for best made chemise. In 1896 Emma became one of the school monitors. We understand that Charles replaced James Brant to become the second stationmaster in Thornbury about 1889. By 1901 the family were living in the Station Master’s House. Lois was a dressmaker, Mabel Grace had become a school teacher and Charles had become an apprentice carpenter. Phillip was away in Worcester were he was working as a railway clerk. Emma Elizabeth died 8th December 1910 aged 28 years. The 1911 census shows Charles and Emma living in the Station Master’s house with their four children: Philip and Harold were working on the Midland Railway as railway clerks, Mabel was a teacher and Charles was a carpenter. We understand Charles retired as stationmaster in March 1921 after 52 years of railway service. He was presented with a timepiece in honour of his years of service. The photograph on the right shows the family at Station House in Thornbury. We believe that Charles and Emma are the older couple in the front. Emma died aged 68 on 21st October 1926. On 9th April 1935, Charles’s daughter, Mabel Grace bought Jubilee House in Gillingstool for £630 and Charles moved there with Mabel and Phillip who had taken over as stationmaster from him. Charles died on 25th April 1945 at the age of 90 years and was buried in Thornbury Cemetery. The 1950 electoral register shows the house was then occupied by three of Charles’s children: Mabel Grace, Phillip John and Harold Egbert. We understand that Horace left to live in America. Phillip John Cooper entered the railway service in 1892 as a clerk under his father. In 1894 he went to work in Montpelier in Bristol and then to Leicester, and Worcester (around 1901) and then Cheltenham. While at Cheltenham he served with the forces during the First World War. He took over as stationmaster at Thornbury from his father who retired in 1921 and carried on in that capacity until 1937 when he too retired. Phillip Cooper died on 24th March 1950 aged 72 years. His grave stone in Thornbury Cemetery refers to the fact that he was a “serving brother of St John of Jerusalem”. This is a charitable organisation with an ancient tradition of helping the sick and the poor. We would now recognise it as St John’s Ambulance. Phillip joined the order in 1943 having first attended a St John’s first aid class as far back as 1906. It was not until he came back to Thornbury as station master in 1921 that he took up first aid work seriously. He organised first aid classes and in the Second World War was appointed First Aid Commandant and later ran first aid courses at the Police Training School at Eastwood Park. Phillip was also very active in the local British Legion and he was responsible for organising the yearly Poppy Day collections. Harold Egbert Collins Cooper – born in Thornbury on 15th January 1890. He attended the National School and in January 1903 he passed the exam for Thornbury Grammar School. Acccording to the log book of the National School he was one of only four children to receive a scholarship that year. His name is listed in the admissions register of the Grammar School but there is a note in the register saying ‘failed to gain scholarship’. We don’t understand what happened. On 13th November 1915 he was attested to serve in the Army. He was approved and joined the Royal Engineers as a Sapper on 22nd February 1916. His address at that time was 32 Station Road, Oxenhope, Keighley. He was a single man working as a railway clerk for the Midland Railway. He was described as being 5ft 5 1/2 inches with a 38 inch chest (with range of 3 inches) and with no distinguishing marks. He became a Lance Corporal in July 1917 and promoted to the rank of C.Q.M.S (which we assume to mean Company Quarter Master Sergeant) in July 1918. Throughout his service Harold’s specialism was as a Clerk. In May 1917 Harold was punished for failing to salute an officer in the High Street of Maidstone. He was ‘admonished and given one hours statutory drill’. He doesn’t seem to have suffered any disability whilst serving but he was admitted to hospital for a few days in January 1918. The records appear to show that he was due to be demobbed and transferred to the Army Reserve in May 1919 when his address was given as Glanville Street, Stone in Staffordshire. However he was transferred to the Royal Engineers Dock Troops and served in Cherbourg until he was finally returned to the UK in September 1919 and demobbed. At that time he gave his permanent address as Thornbury. Harold was listed as living at home with his parents at Station House in the 1921 electoral register. By 1927 he had moved elsewhere and was not listed again until 1950 when he was living at Jubilee House in Thornbury with his sister, Mabel, and brother, Phillip. We don’t know anything about where he had previously lived or how he was employed. It is possible that he married Elsie M Burrows in the Bristol area in 1926. Harold died in Thornbury on 21st February 1951 aged 61 years. His probate record shows that his brother Charles and sister Mabel were his executors. Mabel Cooper was a school mistress in Thornbury for many years. In February 1901 she was presented with a gladstone bag and an album listing the names of contributors on leaving Buckover School. She had been connected with the school as monitor or pupil teacher for seven years. She started as a temporary teacher at the National School on 9th October 1900. The Council School log books show that Mabel passed her exams to become a certificated teacher on 7th March 1908. During this period she regularly suffered from ill health and was often away from the Council School. In March 1913 she was ordered by her doctor to go to the seaside to recuperate and she did not return to school until 1st July 1913. Shortly after this she applied and was offered a post at another school, but she decided to stay at the Council School. On 9th April 1935 Mabel bought Jubilee House for £630 and it became the family home for her father and her siblings. The register compiled in 1939 in preparation for the war shows Mabel as a retired school teacher. She carried on living next door to the school at Jubilee House until the town’s re-development in the late 1960’s when she was forced to sell the house under a compulsory purchase order. However she died on 27th March 1970 aged 88 years before she was forced to leave her house. Charles Newbold Cooper– a report in the South Gloucestershire Chronicle of July 28th 1916 says that ” Private Charles Cooper is in hospital with shrapnel wounds in the leg and arm. He has been in France about one year and four months. He is the son of Charles Cooper of Station House.” Although Charles had been in the army for such a short time he had been in hospital twice before; once with dysentery and once with an injured shoulder when a trench collapsed on him. Before enlisting he was a carpenter for Tucker Brothers. The Gazette of 4th January 1918 said that Charles Cooper had recently returned from captivity in Germany and that he had been awarded the Military Medal. Charles was an executor to his brother, Harold’s, will when he died in 1951. He was described as a carpenter at that time.